There’s been a whoooole lot of VR at GDC last week. Every third developer session was about making things for Oculus Rift, HTC Vive and/or PlayStation VR. Of the many major questions about these headsets’ comfort and viability, the one I kept hearing is: can I really wear this thing over normal glasses? All the VR headsets are ostensibly designed to be worn over glasses, but depending on your frames and how short-sighted you are, it varies in comfort. Personally, I have big ol’ hipster nerd glasses that cover half of my face (see below), and am so short-sighted that without them I can see pretty much nothing. Having spent 3 days jumping between realities, these are my findings. The good news: all the headsets did physically fit over my glasses. The Oculus Rift was the tightest fit—sometimes I had to remove my glasses and put them inside the headset first, before putting the whole thing over my face and adjusting the straps. It was also a little snug: the headset was pressing my frames into my nose, which got uncomfortable after 20 minutes or so. The HTC Vive was easier to put on. I didn’t have to take my glasses off and insert them, I could just put the headset on normally. But like the Rift, the positioning of the head-straps meant that the unit did weigh on the frames a bit: both headsets put weight on the nose, which for a speccy person translates to pressure on the top of the frames. PlayStation VR was the most comfortable, for two reasons. The weight of the headset is mostly on your forehead and the top of your head rather than your face, thanks to the positioning of the headband, which means you barely feel any pressure on the nose. 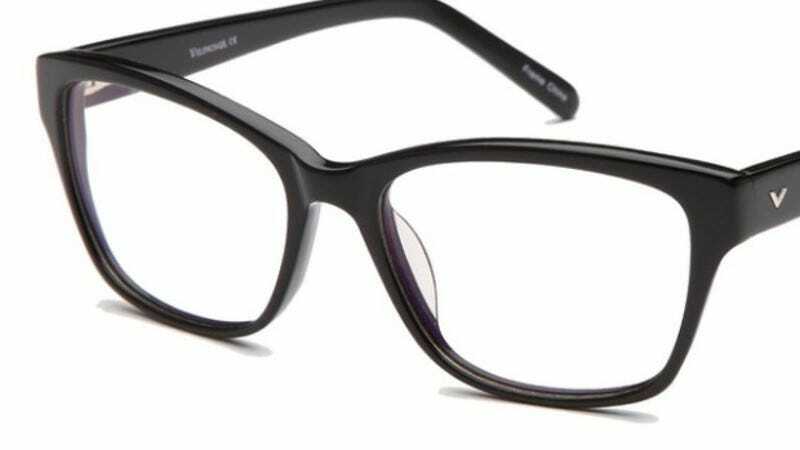 Secondly, instead of solid black foam blocking out the gaps between the headset and your face, it has flexible black rubbery plastic that doesn’t interfere with your frames. The weirdest thing about VR for a glasses-wearer is that you suddenly have perfect peripheral vision. My whole life I’ve seen the world through rectangular lenses, and in VR my field of view was suddenly much wider. It spooked me a bit (and made me consider laser surgery for about the 50th time). On Monday I ran an endurance gauntlet of VR demos: 10 games, 30 minutes each, one after the other. Unfortunately, without glasses, I can’t see in VR properly. I don’t know enough about ocular physiology to understand why this is, but the adjustable focus on the headsets is never enough to help me see. I’m going to try putting contact lenses in when I get these things at home. If you can cope without your glasses, that is going to be the most comfortable option, but the good news is all the different headsets are perfectly usable with specs.